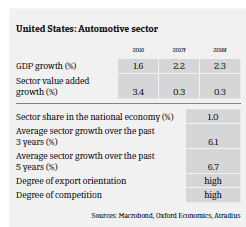 The US automotive sector has steadily rebounded since the severe slump in 2009/2010 triggered by the global credit crisis. According to the International Organization of Motor Vehicle Manufacturers OICA, US vehicle production increased 0.8% year-on-year in 2016, to 12.2 million units. Registrations or sales of new vehicles increased slightly (up 0.1%) to 17.9 million units. Production and sales of SUVs and trucks continued to grow in H1 of 2017. The US market for smaller and mid-sized passenger cars seems to have already reached its peak, despite robust consumer confidence, readily available consumer credit, a GDP growth forecast of 2.2% in 2017 and gas prices among the lowest levels since 2003. The reasons for the decrease in sales are car life spans which have increased (from an average of 8.4 years in 1995 to an average of 11.4 years in 2014), a glut of nearly-new used vehicles, the rise of car-sharing services, coupled with an uptick in urban living, and a pile-up of inventory, which has been reported at its highest level in over five years. In H1 of 2017 automotive sales decreased by about 2% year-on-year, and higher inventories could potentially impact businesses’ short-term profit margins, as production is expected to remain relatively flat in 2017, while the decreasing sales have caused car dealers to increasingly offer large sales discounts. As sales decrease, manufacturers have started to adjust from what has been a growth environment to a more flat market situation, e.g. by starting to shed jobs. Besides the potential risk of a lasting sales downturn affecting businesses margins along the whole value chain, the economic policies of the Trump administration could pose another potential challenge, especially the announced Border Adjustment Tax (BAT) as part of the administration’s tax reform. A BAT would provide tax breaks to US companies that export products, while, at the same time, it would remove tax breaks for US businesses that import goods from abroad. While this is ultimately aimed to protect American jobs and to offset cuts in US corporate tax, the potential impact on the industry could be significant. Some major US automotive industry stakeholder have publicly spoken out against a BAT introduction, arguing that it would result in higher sales prices for cars and trucks, up to between USD 2,000 and 3,000 per vehicle. It could have a negative effect on automotive sales and hurt the margins of most manufacturers and suppliers alike. The same accounts for a 20% or 30% tariff on goods from Mexico, as there would be high costs for rebuilding production capacities in the US, while the domestic production of smaller vehicles is no longer economically viable for US manufacturers, making offshoring production to countries like Mexico unavoidable. US automotive businesses tend to be highly leveraged, since the sector is very capital-intensive. Access to external funding has steadily improved since the 2008 credit crisis, due to improved trading conditions within the sector, relaxation within the traditional credit markets and access to funding via government-backed programmes. Banks are generally willing to lend to the industry. The average payment duration in the US automotive industry is 30-60 days. Payment behaviour in this sector has been satisfying over the past two years. The number of protracted payments, non-payments and insolvency cases has not increased in 2016 and H1 of 2017. 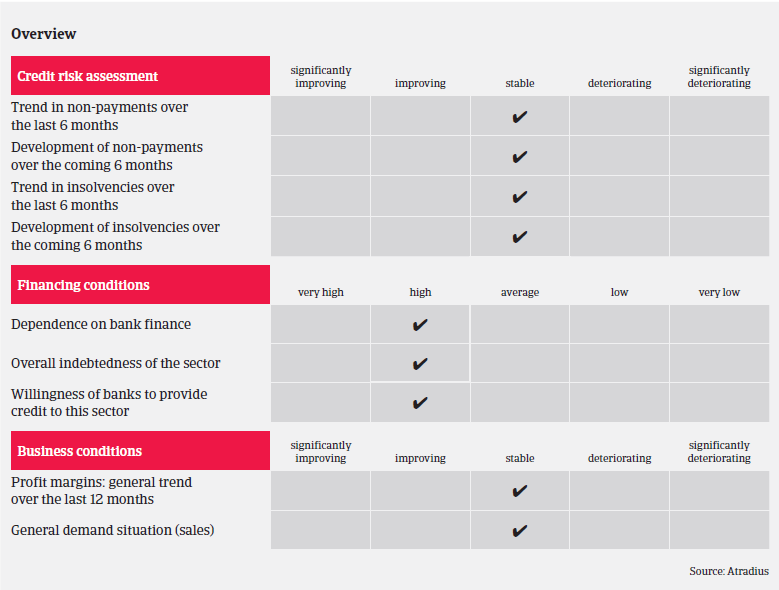 Given the stable performance outlook, we expect the current insolvency rate to remain unchanged. While in H1 of 2017 we have seen some slowdown in the industry, automotive businesses are currently in better position to deal with any deterioration of market conditions, following various re-structuring/cost cutting measures taken during the last recession after 2008. 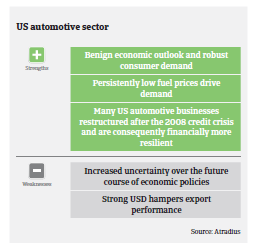 As long as no major downturn scenario (sharp sales downturn/adverse economic policies) materialises, we expect gross margins of automotive businesses to remain stable in the coming months. Due to the generally satisfying main indicators and a benign credit insurance claims environment we still assess the credit risk and business performance of the automotive sector as “Good”, and our underwriting stance continues to be open. One issue we face is that a large number of automotive companies are privately owned, and therefore not obliged to publically release financial information. As a result, our need for financial disclosure and information is high.